Unlike other electrodes that can cause hot spots and nipping, the Kegel8 Pack of 4 Sacral Electrode Pads is designed to the highest quality for the very best results. The pads are specially designed to specifically target the sacral area which is very beneficial in treating incontinence in both men and women. you can read more about sacral nerve stimulation in our article in the Your Pelvic Floor section. For Women: the Sacral Electrode Pads x4 can be used with a Kegel8 Ultra 20 electronic pelvic toner to help treat incontinence. 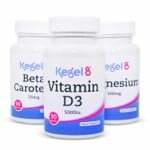 A number of Kegel8 Ultra 20’s programmes can be used with electrodes placed at the base of the spine (the sacral area) to treat different kinds of incontinence, which is ideal for women who can’t, or don’t want to, use a probe. For Men: these Sacral Electrode Pads can be used with a Kegel8 V For Men electronic pelvic toner to treat incontinence. 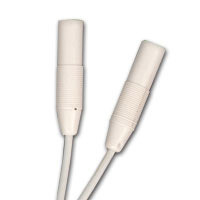 These electrodes can also be used with any other Kegel8 units and TENS machines on a pain relief programme. The special design of the Sacral Electrode Pad is specifically shaped for effective treatment, and can also be used on the perineum. 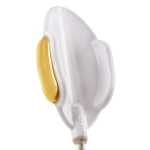 These electrodes attach to your Kegel8 pelvic floor exerciser via your leadwire – simply plug the wire into your pelvic toner and follow the instructions in your User Guide. To prolong the life of your electrodes, we recommend that you apply your electrode pads to clean, dry, oil-free skin then when you have finished exercising, stick the electrode pads back onto the clear backing and put them back in the bag. 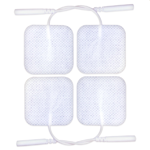 With proper care, as per the instructions included with your electrodes, these electrode pads are reusable and can last up to 4 weeks if used daily. These skin electrode pads are fitted with 2mm male pigtail connectors and are compatible with all Kegel8 Pelvic Toners (Ultra, Ultra 20, Vitality and the Tight and Tone Pelvic Toner) and TENS/STIM/EMG machines via your leadwire.